Amundi, as an asset manager, is acutely sensitive to the calibration of market prices. Yet where its initial public offering is concerned, owner Credit Agricole <CAGR.PA> can afford to brush such matters off with a Gallic shrug. The biggest attractions of Amundi are its scale and efficiency. Costs are just 53 percent of its total revenue, below most of its peers – partly because two-fifths of its assets pertain to low-maintenance funds from its owners’ insurance businesses. While the majority of its 952 billion euros of assets under management are bonds, and thus exposed to risk from higher global interest rates, Amundi has seen inflows even as fixed-income funds have experienced the opposite. Most of those now come from outside France. The price, meanwhile, isn’t too insouciant. Lop off the company’s 1.3 billion euros of surplus capital, and the remaining stub would be valued at 12.5 times forward earnings at the mid-point of its suggested range. Amundi would be priced at roughly a 15 percent discount to rival Schroders. By comparison, Credit Agricole paid around 14 times forward earnings last year – not including the effect of any surplus capital it then held – to raise its stake by 5 percent. That reflects the dynamics of who is selling, and for what reason. French lender SocGen <SOGN.PA>, which is selling its entire 20 percent stake, wants a clean exit. Given the lack of new growth capital – no new shares are being issued – the possibility that surplus capital will be frittered on dubious acquisitions, and risks to the bond market, something closer to the bottom of the range may be more comfortable. At that price, Amundi offers a solid investment story. Credit Agricole, which will be left with control and a new acquisition currency, will be mostly unfazed either way. Bof. People walk near the Amundi company headquarters in Paris, France, October 7, 2015. Amundi set its initial public offering price range at 42 euros to 52.50 euros per share on Nov. 2. That would value the French asset manager at between 7 billion euros and 8.8 billion euros. 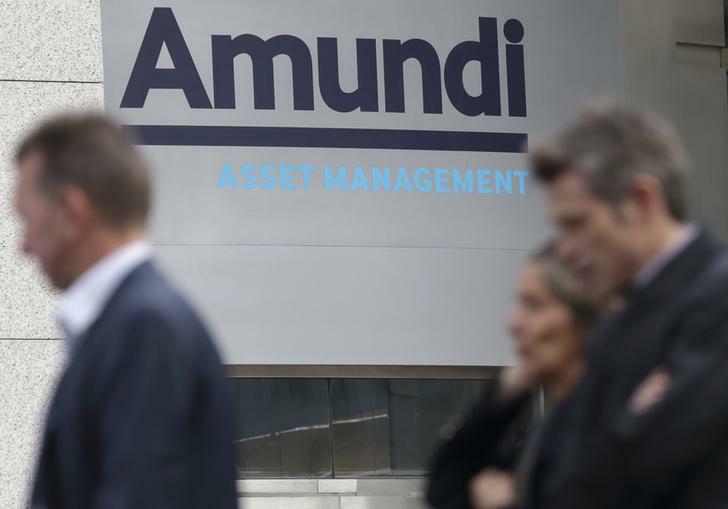 Societe Generale, the French lender that owns 20 percent of Amundi’s stock, plans to sell its entire stake in the offering. Credit Agricole, another French lender, would keep the remainder of Amundi’s shares, aside from selling a 2 percent stake to a subsidiary of Agricultural Bank of China, with which Amundi has a joint venture. Amundi said on Oct. 27 that it expected to make earnings of 535 million euros for 2015, excluding any charges related to the listing of the company’s shares.